About a year ago my family moved out to Oklahoma City after spending years in the San Francisco Bay Area. While we love where we live now, you can't take our love of Bay Area sports teams out of us! As far as NBA basketball, we are Golden State Warriors fans through and through. At my office I am known as the lone Warriors fan and my kids proudly represent the Dubs while at school. If you ask my kids who their favorite Warrior's player is they will tell you it is two-time MVP Steph Curry. Kevin Durant is second but my two older kids love Steph. The Warriors are coming to town this week to play the Oklahoma City Thunder, but unfortunately we can't get our hands on these sold-out tickets. I would love to take my two older kids, but my wife doesn't really like the idea of taking out a second mortgage on the house to do it. So because we still want to support the Warriors this week, I made my kids this Steph Curry sandwich lunch. The sandwich is based on Steph Curry's jersey. 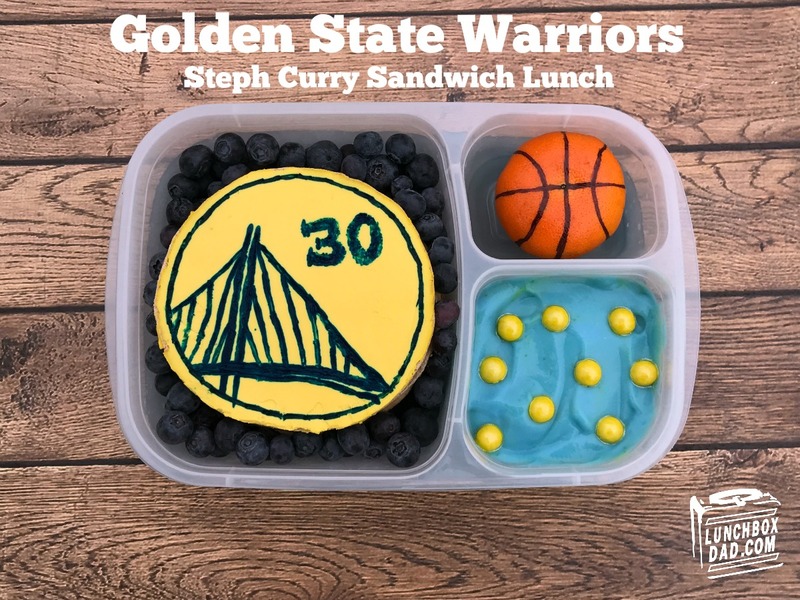 Hopefully this lunch will bring the Dubs some luck and if anyone out there knows Steph (or any of the other Warriors) tell them there will be at least one family rooting for them in front of the TV in OKC this weekend! 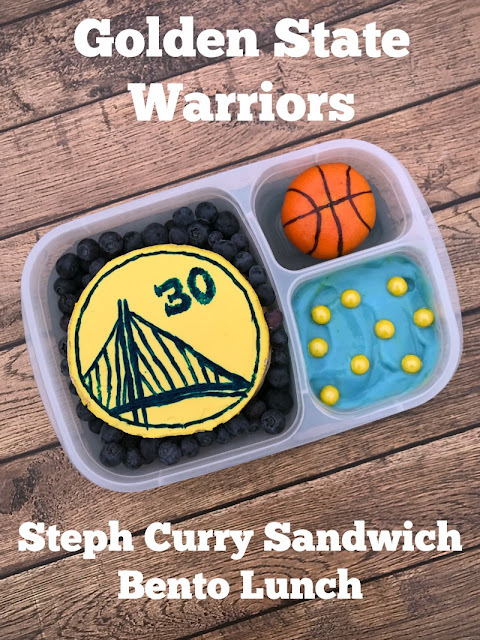 If you want to make your own Warriors lunch (for your kids of course) check out my recipe below. I made this lunch in Easy Lunch Boxes container. Ingredients: Two slices of whole wheat bread, fat-free cream cheese, jam, blueberries, mandarin orange, greek yogurt, yellow sprinkles, blue and yellow food coloring, black sharpie marker. 1. In bowl mix cream cheese with a few drops yellow food coloring. Spread on one slice of whole wheat bread cut in the shape of a circle. An easy way to cut the bread is with a cookie cutter. 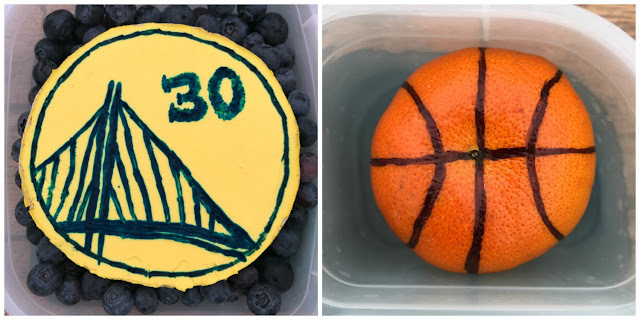 Use toothpick and blue food coloring to draw on Warrior's logo and Steph Curry's (or favorite Warrior's) jersey number. Spread jam (we used some homemade strawberry jam) on other slice. Gently place top slice onto jam covered slice. 2. Put sandwich in middle of main lunchbox compartment and surround with blueberries. 3. Draw black lines on mandarin orange peel as shown. This will create the basketball. Place in side compartment. 4. Mix greek yogurt with a few drops blue food coloring. Spoon into second side compartment. Drop in yellow sprinkles to make the Warrior's blue and yellow team colors. Serve to your kids!